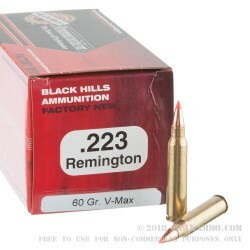 Turn your AR-15, Mini-14, or other .223/5.56 NATO rifle into a fearsome varmint gun with this ammunition from Black Hills! 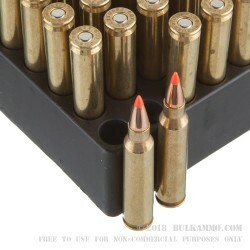 Each cartridge in this 50-round box fires a 60 grain polymer-tipped Hornady V-MAX bullet at 3,100 feet per second. 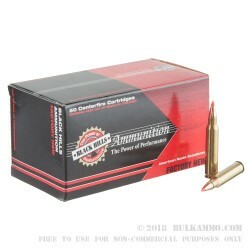 With a heavier bullet than most varmint loads, this ammunition from excels in particular against larger pest animals like coyotes or raccoons. 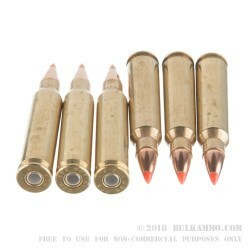 Black Hills ammo is made in Rapid City, South Dakota using reloadable brass and non-corrosive primers.